The only independent full service mobile dual path KU/HD satellite transmission unit residing in the county of San Francisco. Our staff offers over 40 years of dependable, reliable and affordable services 24/7. From breaking news to sports, special events and corporate webcasts Central Coast Uplink is your companies ideal choice for critical mission satellite projects in the Bay Area & beyond. DIGITAL MPEG 4 HD/SDI and KA IP SYSTEM! Whether you’re capturing a fast-breaking news story in downtown San Francisco or producing a corporate video in suburban Watsonville, CCU and partners can deliver an experienced crew who focus on creativity and customer service With over two decades of experience, plus state of the art equipment, CCU will meet the unique logistical and production challenges of breaking news and news magazine programming. 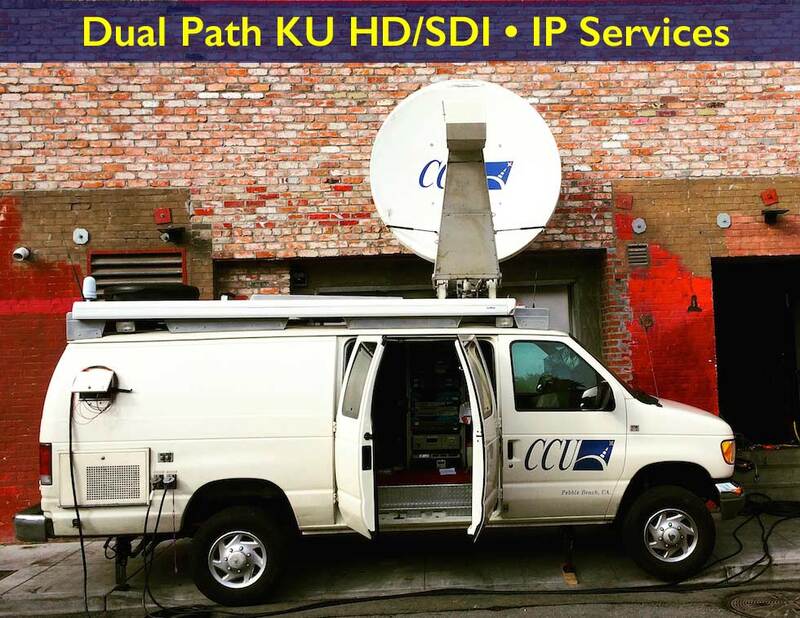 CCU’s uplink systems are built on the easily-maneuverable Ford E-350 Super Cargo Van (we don’t stop at weigh stations). Standard ENG duties run through fully proven rack electronics. For SNG operation, the Alpha AVL 1.8 satellite antenna is integrated with a GPS auto positioner, 2x ADTEC EN91 encoders offering 2 paths of digital KU, fully redundant power source and other advanced digital components to provide today’s highest levels of reliability rock-solid performance. Offering unrivaled flexibility our satellite IP systems are a perfect solution for in-the-field IP applications. Based on compact and lightweight satellite technology our systems deploy in minutes in any location, enabling content delivery and communications quickly and effectively wherever you need it. We have producers, directors, camera operators and sound technicians that can provide network quality HD or SD support for ANY assignment. Check out our great truck and crew deals with fully equipped network experienced EFP/ENG crews. Need a WebCast?, VNR? or SMT? CCU and Video storytelling will help coordinate your event and feed it via satellite or microwave to radio and television stations worldwide. CCU’s partners offer a turnkey video news release service package including audio/visual production and satellite broadcast. Peter Ornstein, senior producer. CNN San Francisco, Ca. Randy. We had a blast working with you and sincerely appreciate all your hard work & assistance. Everything went as smoothly as we can ever hope. You were a pleasure to work with and I hope to see you again down the road. Senior Satellite Operations Manager. Turner Broadcast Newtwork.